The long wait is finally over as ¡MAYDAY!’s Strange Music debut, Take Me To Your Leader, is officially available and hip hop is showing its support for Miami’s six man threat. 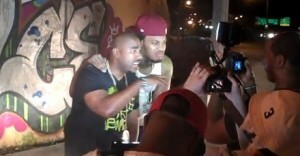 In this exclusive behind the scenes clip from the “Lehhhgooo” music video shoot, N.O.R.E. and Waka Flocka show some love for ¡MAYDAY! and remind fans to pick up Take Me To Your Leader today! With some of the most respected names in hip hop standing behind them, ¡MAYDAY! begins the takeover. What did you think of the shout outs? Did you get your copy of Take Me To Your Leader yet?